Arashiyama (嵐山) is one of the best tourist spot in Kyoto. It is located western Kyoto and surrounded by Mountains that offers beautiful Koyo, the autumn leaves, in Fall. There are many historic temples, classic view and rich nature. Therefore, it was used to be 2nd house resort for Nobles and the imperial families during Heian period. Today, it still remains the classic view of Kyoto with rich nature and traditional temples. The most famous bamboo grove walk is also located in Arashiyama. There is parking. The restroom is located near Arashiyama Rakan. Don't visit here by car. 1. use JR Sanin Line to　Saga-Arashiyama. 1. use Local bus to Tenryujimae or Arashiyama. Arashiyama is located western Kyoto city. 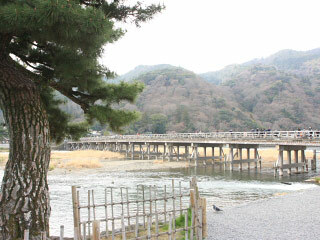 Around the area of Togetsu Bridge including the mountains are commonly considered as Arashiyama. The actual name is Saikyo Ward. It is very popular for Sakura and Koyo, the autumn leaves. The entire sites are registered as national historic site and scenery. Because of its beautiful nature and scenery, Arashiyama had been used to be 2nd house resort for Nobles and the imperial families since Heian period. Therefore, there are many beautiful temples, and traditional houses. It is one of the best spot to walk around Kyoto. Also, around the stations (Arashiyama has three stations. ), there are many gift shops, food stands and restaurants for tourist. Tenryuji was established in 1339 by Ashikaga Takauji, the first Muromachi Shogun. It has a beautiful Japanese garden that is the 1st registered special national scenic beauty, and UNESCO World Heritage Sites. There are about 70 Rakan Statues. They are belong to Hogonin Temple. Popular for Match making. The Torii Gate of this shrine takes the oldest style in Shinto. This bamboo Forest might be the most famous bamboo walk in the world. It is located at the out side of the north entrance of Tenryuji. … is the beautiful Japanese garden.